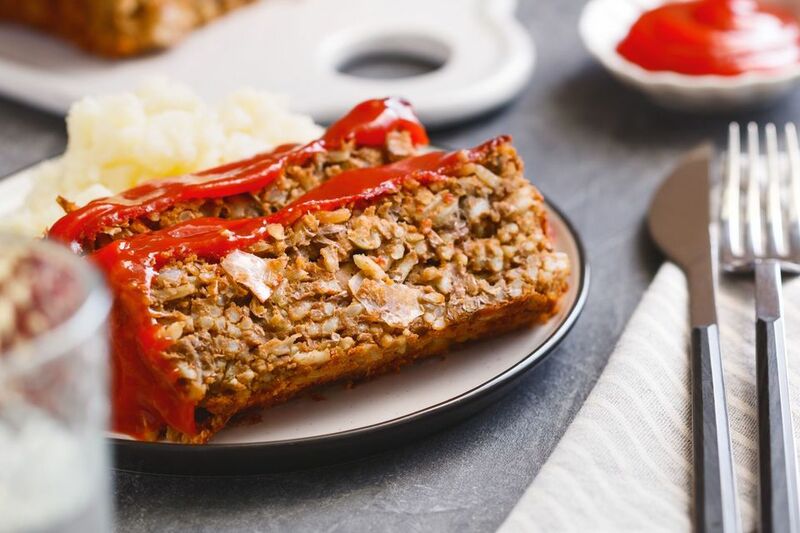 This recipe for vegetarian, vegan, and gluten-free lentil loaf made with rice and lentils is easy to prepare and economical for families on a budget. Best of all, it's one of the many vegetarian loaf recipes and lentil loaf recipes that doesn't taste like sawdust! Made from just a few inexpensive ingredients, this is a great way to stretch your dollar, use up leftover rice, and give your family the protein they need. One cup of cooked lentils packs a whopping 18 grams. While this lentil loaf is great any day of the year (and leftovers make terrific school or work lunches), you can smother it in vegetarian gravy, serve with your favorite potato dish, and enjoy it in place of turkey, ham, or even tofurkey for a holiday entrée. Heat oven to 350 F. Rinse the lentils and drain. Fill a large soup or stock pot with water or vegetable broth and add the lentils. Bring to a boil, reduce the heat, and simmer until cooked - about 30 minutes. Don't skimp on the cooking time for these lentils because you want them to be very soft so they will mash up easily. Drain thoroughly then mash the lentils while they are still hot and until they are a little more than half mashed. Set aside. In a skillet, sauté the onions and garlic in olive oil for 3 to 5 minutes, or until soft. In a large bowl, combine the onions, garlic, and olive oil with the mashed lentils and add the rice, salt, ketchup or barbecue sauce, sage, and Italian seasoning. Mix well. Gently press the entire lentil mixture into a greased loaf pan. Drizzle a bit of extra ketchup on top. Bake the lentil loaf for 1 hour, basting with additional ketchup every 15 minutes or so. Allow it to cool slightly before slicing and serving, as this will help the lentil loaf firm up. While lentils and rice are gluten-free foods, if you are preparing this for someone with gluten sensitivities, make sure all the products you use, especially the ketchup and barbecue sauces, are gluten-free or have been processed in a gluten-free facility. For busy lifestyles, this loaf can be made ahead of time for quick cooking the next day. Prepare the lentil loaf the day before, place it in a loaf pan, cover it with plastic wrap, and refrigerate. Be sure not to cover with ketchup or barbecue sauce before refrigerating. The next day, let it come to room temperature, top with additional sauce, and then bake it using the directions above.